D will tell you - if somewhat tiredly - that I am loath to make the same dish twice. Maintaining this site means constantly searching for new recipes to tell you about, and returning to an old favorite means passing up the opportunity for a new dish, which, if we love it, means a new post. Aside from re-testing recipes I'm planning to blog, I've settled into a somewhat maddening pattern of behavior: I make a recipe, love it, rave about it, promise to add it into the rotation, and then blithely move on to something unfamiliar, leaving the old-new favorite on the (overloaded) back burner for eternity. If I could break that habit just once, it'd be for these jerk chicken sandwiches. 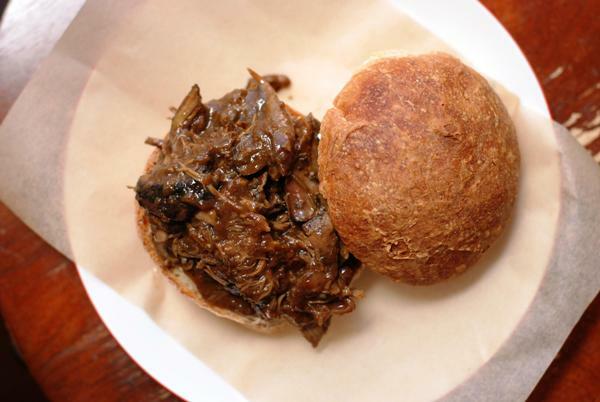 It started the way no other jerk chicken story has ever started: with rolls. Before jetting out of the house on Friday morning, I glanced in the fridge and probably uttered an expletive as I realized I'd forgotten that I'd put up pizza dough the previous day, hoping to make pizza when I got home from work. I didn't get home till 9, and neither did D, making pizza night unrealistic. But the dough had fully risen in the fridge, and I'd have hated to waste it. So I threw caution to the wind, punched it down, and formed it into rolls. Rolls that turned out seriously, honestly, delicious. They were so good, I made a second batch. The good thing about serving rolls for dinner is that you don't need to make challah. Sometimes, there just isn't enough time for that. Having crossed that off my list, I started brainstorming what our guests might like to eat on/in their rolls. That's when I remembered this jerk chicken recipe I've wanted to make for ages. Sure enough, you could make it in the crock pot - easy! - and you were meant to eat it atop crusty French rolls, which by some miracle I now had. Friday was so busy and involved so much running around that I actually showered twice. To say I threw this dinner together somewhat haphazardly would be an understatement. I tossed some asparagus and cauliflower under the broiler as the rolls baked, and made one dressing to use on both. I made the easiest cake ever. And I made this jerk chicken, which - if you use boneless chicken thighs - involves little more than browning chicken, mixing together a bunch of things you probably already have, and then letting them get to know each other for a few hours in the crock pot. In a pinch, you can even skip the browning. I told you I made my own rolls, and I've included the (very easy) recipe for those below. But you can definitely buy the rolls instead. That'd bring this dinner within reach for a weeknight. And since I don't think our work lives will be getting less busy anytime soon, I just might put some jerk chicken in the crock pot tomorrow night. If I were in town for Memorial Day weekend, I'd definitely do it again then. I told you, it's a recipe you'll want to make again and again. As I said above, this recipe does have two steps - browning the chicken and braising it in the marinade - but the browning can be skipped in a pinch. If you do skip the browning, simply add the rub ingredients to the crock pot along with the rest of the marinade ingredients. Another note about cooking this recipe: it can be made either in a crockpot or in a dutch oven. If making in a crockpot, turn the crockpot onto warm before starting on the chicken, so that it'll be hot by the time the chicken is browned. In that case, you can use whatever pan you'd like to brown the chicken: stainless steel and cast iron both work. If making the chicken in a dutch oven, you can do both the browning and braising in that same pot. Brown the chicken: Combine spices in a small bowl. Sprinkle over chicken and rub in to coat all over. Set aside. If using a slow cooker, turn on "warm" setting. Pour 2 tablespoons vegetable oil in either a heavy-bottomed metal pan or a dutch oven (see headnote) and turn heat to medium-high. When pan is hot, place chicken in pan in a single layer - you'll likely do this in batches - and cook until underside is golden brown. Flip and repeat with the other side. When both sides have browned, remove chicken to a plate (if doing the braising in that dutch oven) or to your slow cooker. Chicken will still be raw inside. Repeat with remaining pieces of chicken. When the chicken is ready, remove bones and shred meat into small strips. Return shredded chicken to pot or slow cooker with sauce until ready to serve. Serve on halved crusty rolls (recipe below) with plenty of napkins. In a medium bowl, stir together the flour, yeast, salt, and sugar. Add the water and use a large fork or your hand to mix until blended, at least 30 seconds. The dough will be stiff, not wet and sticky. Cover the bowl and let sit at room temperature until the dough has more than doubled in volume, about 2 hours. Divide the dough in half, and divide each half into 4. Shape each ball into a roll by gently tucking the edges under and into a point at the center of the roll on its bottom. (There are several videos online explaining how to shape dinner rolls, if you'd like more detailed instruction, but it isn't a particularly fussy process.) At this point, rolls can be placed into oiled plastic bags and frozen, or refrigerated the same way for upto 1 day. When ready to bake the rolls, preheat oven to 450°. Put balls on a lined baking sheet, leaving a good 2 inches of space on either side of each roll if you want them to come out round and with fully crisp crusts. (For rolls more square in shape and with crusts only on top, you can put them closer together on the baking sheet, and they'll bake up more like pull-apart rolls. Again, your choice.) While the oven preheats, proof the rolls for about 45 minutes. Then bake 40-45 minutes, until tops are golden brown and rolls sound hollow when tapped. Let cool completely, then slice in half, top with chicken and a ladleful of sauce, and serve.